Successful sales people have always known that being successful in their job requires them to continually learn about the markets they serve, the products offered, the pricing and selling issues related to the product as it grows and changes over the years. This is even more important in combating new product challenges. Selling complex products like locomotives, jet engines, electronic instruments, machines tools and the like is not something someone just picks up after reading some brochures and listening to a webinar. It requires concerted effort, time and the ability to quickly absorbed lots of information and understand it at the most practical levels. They have to be able to understand the product as a selling agent but also to understand how the customer perceives the product and why it might be important to the customer. Getting this deep product knowledge in the hands (and heads) of your sales team is an essential element of enabling growth in your organisation. You can’t add new products to your catalog if you don’t have the capability of selling the new product. We know how organisations are accelerating onboarding of new sales reps, but how are they accelerating onboarding of new products to their catalog? My grandfather sold steam turbine generators for The Westinghouse Company throughout the depression and World War II. He was hired for the job because he had an electrical engineering degree from the University of Pennsylvania. Westinghouse didn’t have time to train engineers. They could teach him about Westinghouse turbines, but he had to know turbines, in general, before he would even be considered for the job. Today, sales people still have to have a prodigious fund of esoteric knowledge, but they also have considerable help in the form of automating certain functions. Just for grins, I looked at sales job descriptions involving Steam Turbine Generators, and it appears that while a few prefer engineering degrees, most just want an undergraduate degree. The technical information needed by sale is organised, indexed and accessible via online mobile technology. Engineers are still hired, but they are more likely to be found in product development or product management. When my grandfather went on a sales call, he took a three ring binder filled with product specs and pricing with him. During his conversations, he could periodically refer to it for answers to customer questions. That was just about as mobile as it would get in those days. Today, that won’t work. Too many products, too many variations and alternate configurations. You might be selling turbines, but you may also sell other complex technology. The specs and pricing for your multiple product lines will change constantly. You would need a trailer full of three ring binders to contain the data. Tablet device serves as the warehouse and hosts the apps (CRM, CPQ and other) you need to apply that knowledge within the context of the sales call. When new products are brought to market, sales managers know it is important that their sales teams gain advance understanding of what the product does, how it works, who it serves and a general idea about how the product is priced. These factors can often cause new product challenges. For many years the easy solution was to bring everyone in for a sales meeting. Get the team in a room, bring in a product manager and a marketing person to explain the product and all the stuff related to selling it. The compensation plan was part of this discussion and the administrative issues related to ordering and delivering the product were included as well. At the end of the meeting, your team knew how to sell the product, who to sell it to and how much to charge for it. What do you do when the new products are coming in on a weekly basis? How do you get your team up, focused and knowledgeable about selling new products when you don’t have the luxury of calling a sales meeting every other day? The sales rep today carries a tablet or laptop and it provides access to a CPQ tool. 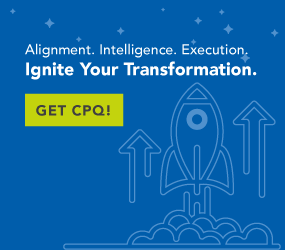 CPQ contains everything sales reps need. CPQ starts with a conversation guide and specification questionnaire. The tool remembers all of the questions necessary to spec the product out in alignment with the needs specific to the individual customer. CPQ puts an engineer in your back pocket. Believe me, it’s a crowded pocket. There is a product manager in there, as well. There is also a pricing administrator, a supply chain expert, a production scheduling manager and an implementation expert, and others. If the pricing for your product changed an hour before your meeting, you will have the current, up to date pricing in your presentation. Let’s say you are selling machines tools to metal fabricating shops. Your guy, newly minted and pretty raw when it comes to manufacturing and machining parts, sits down with his first customer. CPQ is open on his tablet and after a quick exchange pf pleasantries, a conversation kicks off about what the customer does and what challenges they face. CPQ can drive the conversation with interview scripts or it can work like a memory checklist to help the rep cover all the necessary bases. CPQ Asks All the Right Questions! Your guy knows they work with metals, CPQ will remind him to narrow that down and determine what types of metals they work with. CPQ will let him know that he needs to get specific about what functions will be used with the metal. Cutting? Drilling? Molding? Sintering? How will the material be handled in the shop? Will the metal come in rolled form, powder or ingots? Is the metal pure or an alloy, and what are its constituents if it is an alloy? How large will the units produced be? Will they move directly to the line or will they go to a warehouse? Are there any chemical applications applied to or used to treat the metal before or after processing? How many operations per day, per month or year will your tool be expected to complete between maintenance? What types of environments will your metal parts be exposed to after they are installed? What markets are involved? Do they suggest any special QA level, regulatory control or usage limitations? The sales rep doesn’t have to understand why something is important; he or she just needs to remember to ask the right question. CPQ can build these into an interactive questionnaire, or they can be accessed, as needed, by subject. CPQ may not eliminate the need or desirability of pre-existing knowledge, but it certainly helps overcome knowledge disparities among sales reps. A CPQ solution makes your sales reps productive faster and keeps them productive through complex market and product evolutions. And that capability is what will propel growth in your organisation.